It's not hyperbole to say 400 Gradi boasts the best pizza in the world, since its chef, Johnny Di Francesco, won the best margherita pizza prize at the World Pizza Championship in Parma, Italy, last year. And that contest is no joke: Di Francesco beat out 600 chefs from all over the globe for the title. The man is also a VPN principal, which means he's Australia's ambassador to Naples pizza authority Associazione Verace Pizza Napoletana. Finally, he's also responsible for the world's cheesiest pizza. If all those credentials aren't enough to convince you to visit his Brunswick shop, clearly you're a lost cause. 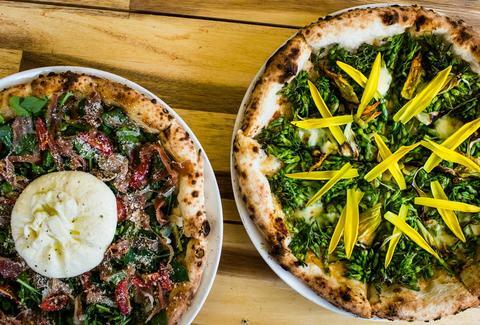 Platform of Personal Pizza for Peace, as it is more formally known, has netted some impressive endorsements, including one from The New York Times lauding its farm-to-table approach -- the vegetables are grown on five local farms and the cheese is made in-house. Owner Yosuke Masuko is such a stickler for quality that he's refused payment for pies that weren't perfectly round, and he personally traveled the country by motorbike in search of the best possible milk. Pizza 4P's house specialty is the Burrata Prosciutto. This pie comes loaded with prosciutto, tomato, and Parmesan, along with a fresh ball of burrata right on top. As one of Masuko's most loyal customers Francesco Patella noted in the NY Times piece, that kind of pizza just doesn't even exist in Italy because burrata is so expensive. And considering he's a former Italian pizza chef, he would know. 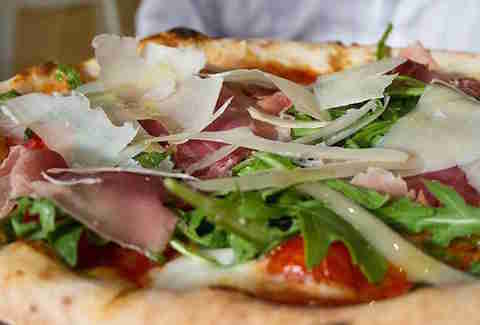 400 Gradi is hardly the only Australian pizza place of note. The country is home to many incredible pies, and you'll find a few of them at Lucio. Consistently hailed as a bucket list pizza destination by outlets like Time Out Sydney, Lucio has that VPN cred and long lines to match. A lot of people rave about the titular Lucio, which is a pie that's half margherita and half ham calzone. But putting a half-calzone pizza on this list seems blasphemous, so we're recommending another favorite, the Filetto, which features heaps of rocket, prosciutto, shaved Parmesan, cherry tomato, and mozzarella. "Pizza" isn't the first word that springs to mind when you think about the island of Bali. But it will be if Pronto Pizza has its way. Pronto has earned rabid (and adventurous) fans who like the seafood pie topped with fresh catches from the seaside town. But if you want a solid classic, go with the capricciosa. And then get the Nutella pizza for dessert, because obviously. Locals love Frida, and it's not because they're all big fans of 20th century Mexican art. Chef Antonio di Blasi has spent 20 years honing his pizza skills, first in Bologna and currently in Palermo. Blasi insists on leavening the dough for at least 72 hours and consistently experiments with new "pizzas of the day" featuring the best seasonal produce. 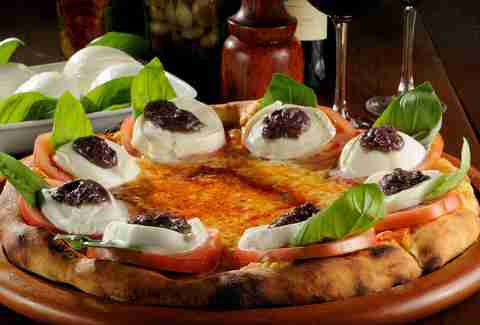 His efforts snuck him onto a "best pizzas in Italy" list and earned him over 1,000 breathless community reviews. 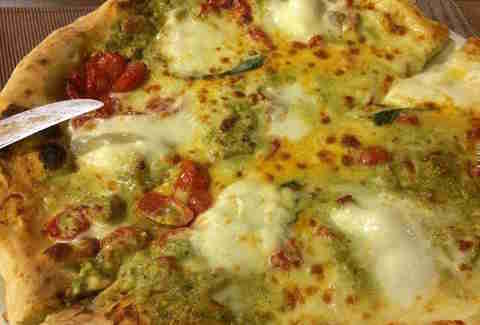 Although pistachio, pesto, tomatoes, mozzarella, and speck shouldn't go together so well, they're kind of perfect on Frida Pizzeria's specialty Nazionale pie. Campo de' Fiori translates to "field of flowers," because the Roman square was supposedly a meadow back in the Middle Ages. Now there are zero daisies to speak of, but one very good forno or "oven" that's churning out popular pies. Forno Campo de' Fiori has been engaged in an intense rivalry with nearby Roscioli for the best pizza bianca (or white pizza) in the city for a while now, though Forno seems to have a slight edge thanks to its chewier, tender crust. If it's August or September, ask for the Prosciutto e Fichi, which is white pizza with prosciutto and figs, but you can't go wrong with the classic pizza bianca any time of the year. "NAP" stands for Neapolitan Authentic Pizza, so you know these guys take their job seriously. (The owners are Italians, and they've got a Stefano Ferrara wood oven from Naples and everything.) 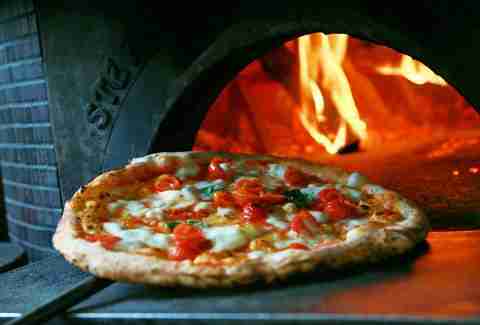 Since this place is all about the classics, you're keeping things simple with one of its margherita pies. Fans consistently hail it as the real deal -- some even claim it's on par with the stuff outta Napoli -- and it's a reasonable price to boot. This beach-town spot translates to "the lovers," because pizza is life/love. Les Amoureux is pretty easily the most beloved pizza joint in Nice, but it's gaining traction worldwide. The owner Ivan has received the official stamp of approval from Eccellenze Italiane, which awards restaurants using the highest quality Italian ingredients, and the dude's a professor at Italy's prestigious pizza school, Accademia Pizzaioli. One of the most popular pies is the Ricomincio da 3, a simple mix of cherry tomatoes, regulation tomatoes, and mozzarella. You can even get it shaped like a heart, if you're really into the amoureux theme. You won't meet many guys named Fabrizio in Cape Town, unless you greet the chef at this authentic Italian spot. (Bonus: the other owner, Erika, is known for her killer wine selection.) At La Frasca, the house-cured ham is almost as big of a deal as the pizza. So make sure you combine both with the Estiva, a beguiling blend of sun-dried tomatoes, eggplant, basil, mozzarella, ham, and fresh herbs. Only 14 pizza joints in Canada have VPN certification, and Pizzeria Libretto is one of them. Well, two of them, since it's an emerging chainlet. Understandably, picking just one pie here is tough. If you like spice, the Nduja sausage pizza is terrific (and the sausage is made in-house). If you're sticking with veggies, the Grilled Eggplant is an excellent option. 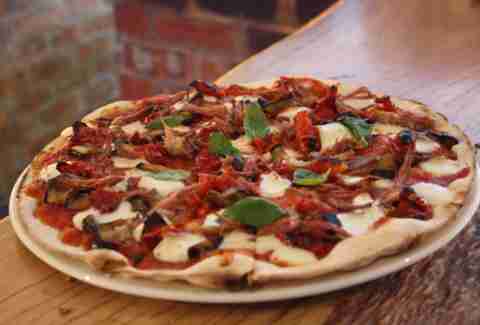 But it's not every day you find a duck confit pizza, and lucky for you, this one of the best you'll ever eat. For the best pizza in Slovenia and gorgeous terrace views too, head to Pizzeria Rustika. It's conveniently located by St. Martin's Church and several hostels/hotels, but this place is far from a tourist trap. Some reviewers place it above even the Motherland's pies, and while that's a bold statement, test out the "4 Siri" (a four-cheese pizza consisting of mozzarella, feta, Parmesan, and Gorgonzola) before you start screaming. It's just one of the tasty offerings at this Slovenian spot, which offers 32 different pizzas. Pizzeria Starita appeared in the 1950s Sophia Loren flick L'Oro di Napoli, and if this place is good enough for Sophia Loren, it's definitely good enough for you. Pizza Starita has been an Italian institution since it opened its doors in 1901 and today, you can easily wait in line for two hours for a piece of that pie. The place is most famous for its Pizze Fritta, or fried pizza, and the Montanara Starita (fried dough with marinara and cheese that's also baked) is its signature dish. But if you can't get to Naples for one, you can at least sample a slice from Starita's maestro Antonio Starita at Don Antonio in New York. The guy mentored Roberto Caporuscio of Kesté, so you know he's a genius. 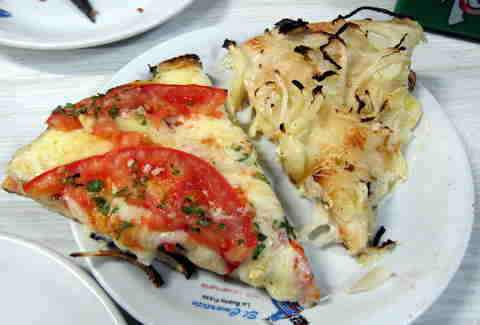 Bráz is considered one of the "most distinguished pizzerias" in São Paulo, which is a very well-regarded pizza city in its own right. And while it has three locations there, it's slowly conquering the country with outposts in Rio de Janeiro and Campinas. Don't let the fact that it's a chainlet scare you off -- locals and tourists alike adore Bráz. And the most-talked-about creation is the Caprese, which boasts buffalo mozzarella, tomato slices, basil, and black olives. This small, family-owned restaurant is definitely off the beaten path. Public transit doesn't run out there, so you'll likely need to hail a cab from the city. But it's worth the trek. Chef Marcello is a friendly old Italian guy who makes all his pies in a wood-fired oven, so you know it's authentic. 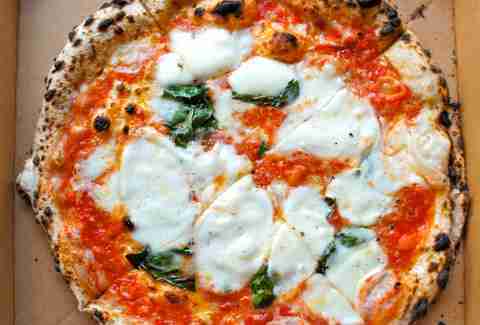 While you can't go wrong with anything he makes, stick with the classic margherita. Italian immigrants came to Buenos Aires in droves towards the end of the 19th century, bringing all their pizza secrets with them. As a result, you can find tons of great pies in the city, though El Cuartito (est. 1934) is an icon. (One particularly fawning Fodor's write-up claims the sauce and cheese alone make locals "misty-eyed.") You're going to try the slice on the right, the fugazzeta. 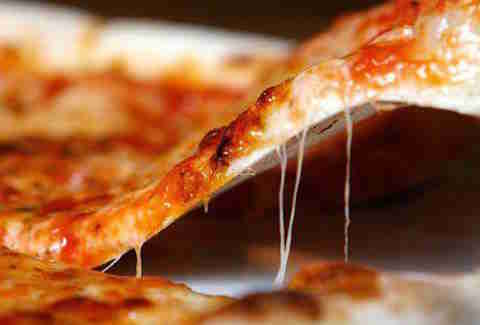 It's a local favorite that ditches tomato sauce in favor of tons of onions and cheese plus a thick crust. One slice may be enough, but we're betting you'll want a second. Kristin Hunt is a staff writer for Thrillist, and would like someone to loan her a private jet so she can conduct an international pizza crawl. Follow her at @kristin_hunt.